Friends for Our Riverfront: Greatest Maritime Disaster in U. S. History ? Greatest Maritime Disaster in U. S. History ? When the Japanese attacked Pearl Harbor, 1,177 men on the USS Arizona tragically lost their lives. Today more than one million people annually visit the memorial, a National Historic Landmark that sits astride the sunken hull. BUT the greatest maritime disaster in U.S. history took place 76 years earlier and much closer to home. 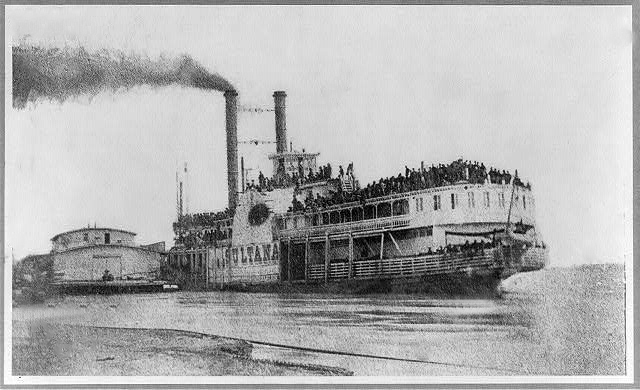 Just across the Mississippi River from Memphis in Mound City, AR, the SS Sultana sank on April 27, 1865. Carrying mostly Union soldiers released from Confederate prison camps, the ship exploded and sank killing an estimated 1800 of its 2400 passengers. Today the ship's remains lie under silt near Marion, AR. Photos from the 1860s and a few fascinating Sultana artifacts are temporarily on exhibit at Bella Vista Commons Shopping Center (2895 Ark. Highway 77, Marion, AR) through March 25 with hopes that eventually a permanent museum in Marion will commemorate the disaster. Sounds like a fun short excursion! Click for stories in the Daily News and Commercial Appeal.